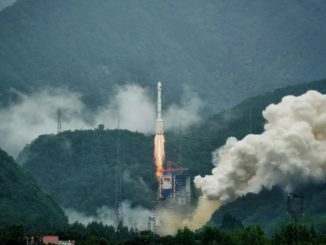 The Fengyun 2H weather observatory lifted off at 1307 GMT (9:07 a.m. EDT) Tuesday from the Xichang space center in southwestern China’s Sichuan province, according to the China Academy of Launch Vehicle Technology, or CALT, the country’s primary developer and manufacturer of satellite launchers. 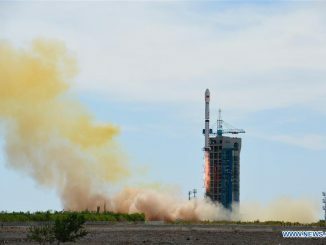 A 172-foot-tall (52.5-meter) Long March 3A rocket carried the weather monitoring payload into orbit, and its hydrogen-fueled upper stage released the 3,042-pound (1,380-kilogram) Fengyun 2H spacecraft in orbit. U.S. military tracking data indicated the Long March 3A booster placed the weather satellite in an elliptical transfer orbit ranging in altitude between 144 miles (233 kilometers) and 22,305 miles (35,897 kilometers), with an inclination of 24.6 degrees to the equator. Chinese officials declared Tuesday’s launch a success, marking the country’s 17th space launch of the year. As a secondary objective on Tuesday’s flight, the Long March 3A’s upper stage conducted an experiment to study the behavior of cryogenic liquid hydrogen and liquid oxygen propellants in space, gathering data for Chinese engineers designing cryogenic rocket stages that could fly longer-duration missions lasting several hours, according to CALT. It was the first time a Chinese rocket conducted such an in-orbit experiment with cryogenic fuel, CALT officials said in a press release. Fengyun 2H’s on-board engine will maneuver the satellite into a circular geostationary orbit in the coming weeks, achieving a perch where it will remain around 22,000 miles over the equator, circling Earth at the same speed of the planet’s rotation. After a four-month post-launch checkout, Fengyun 2H will enter service at 79 degrees east longitude. Its operational meteorological mission is expected to last at least four years. 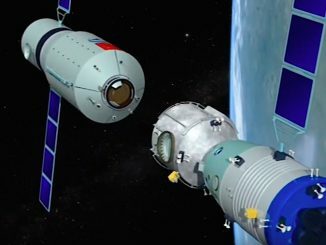 The China Meteorological Administration and other Chinese space authorities agreed to a request from the World Meteorological Organization and the Asia-Pacific Space Cooperation Organization to shift Fengyun 2H’s planned operating position westward from 86.5 degrees east to 79 degrees east, the Chinese weather agency said in a statement. 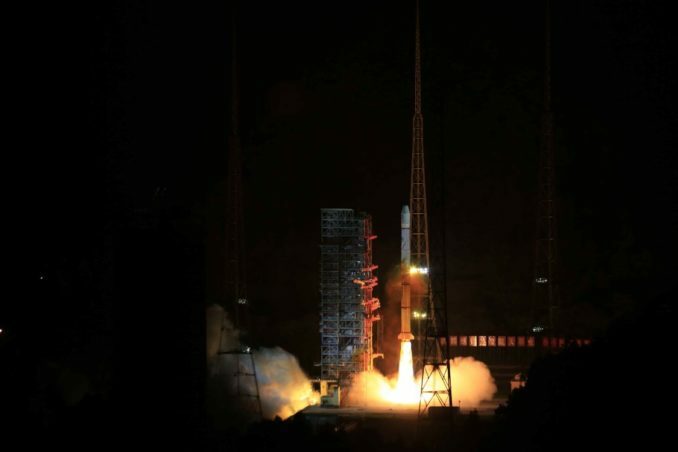 The location change will place Fengyun 2H over the Indian Ocean, giving the new satellite’s imager better coverage of Africa, the Middle East, and Central Asia, key focus regions for China’s “Belt and Road” foreign investment and infrastructure development initiative, intended to address the country’s long-term diplomatic, economic and military objectives. The new geostationary position will also improve weather monitoring over the Indian Ocean, where there is a gap in weather satellite coverage, according to China’s state-run Xinhua news agency. 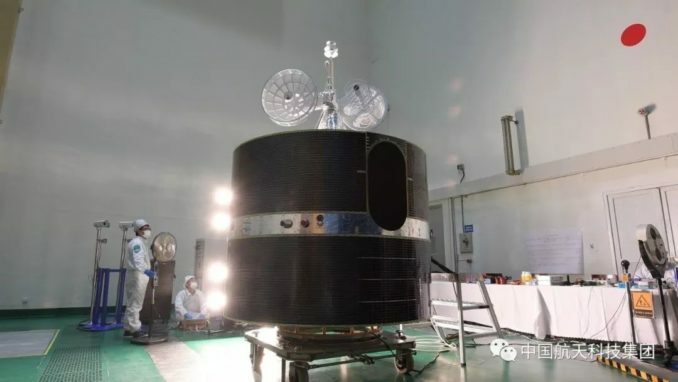 Fengyun 2H is the eighth and final satellite to launch in the Fengyun 2 series since 1997. An explosion explosion killed a worker and destroyed the first Fengyun 2 satellite in a fueling hall at the Xichang launch base in 1994. Three of the Fengyun 2 satellites — Fengyun 2E, 2F and 2G — remain active in operational or standby roles. China’s first new-generation geostationary weather satellite, named Fengyun 4A, launched in December 2016 and entered operational service earlier this year at 105 degrees east longitude after more than a year-long test and validation campaign. Fengyun 2E is located at 86.5 degrees east, Fengyun 2F is positioned at 112.5 degrees east, and Fengyun 2G, previously parked at 105 degrees east, was commanded to drift to 99.5 degrees east once Fengyun 4A began regular weather observations. The latest satellite — Fengyun 2H or FY-2H — will become the westernmost member of China’s geostationary weather satellite fleet, which have missions similar to NOAA’s GOES weather observatories. Chinese meteorologists exchange weather data acquired by the Fengyun satellites with NOAA and Eumetsat, its European counterpart. Fengyun 2H will provide Chinese forecasters data on weather systems approaching China from the west, and emergency authorities in Africa, the Middle East, and Central and South Asia will be able to request dedicated weather observations from the new satellite, which is capable of taking images of localized weather systems like typhoons as rapidly as every six minutes, Chinese officials said. China helped establish ground stations in Pakistan, Indonesia, Thailand, Iran and Mongolia to receive weather satellite data, Xinhua reported. The barrel-shaped satellite is spin-stabilized — rotating at 100 rpm — and carries a scanning radiometer to image Earth’s weather in visible and infrared wavelengths, allowing day and night imagery of storms. Its imaging instrument will take pictures of an entire hemisphere of Earth every half-hour in most scenarios, with the capability to collect scans more often in specific regions. A space environment monitor aboard Fengyun 2H will detect solar X-rays and high-energy particles to support space weather forecasting. China has a fleet of polar-orbiting weather satellites working in concert with the geostationary Fengyun constellation. The upgraded Fengyun 4-series satellites are larger and designed to function longer than the Fengyun 2 satellites. The Fengyun 4 satellites carry imagers to capture more detailed views of clouds and storms, a lightning detector, and an infrared sounder to measure temperatures, moisture, ozone and atmospheric instability at different altitudes in the atmosphere. China’s next geostationary weather satellite, Fengyun 4B, is scheduled for launch in early 2019, according to an April presentation by representatives of China’s National Satellite Meteorological Center at an international meteorology workshop.